I’m reposting this handy Transfer Methods post, as I’ve added some new information to this article. I hope you find it helpful! Time and time again, the question that I get asked most frequently by my readers, is “How can I transfer your Graphics on to _____”. Even though I have numerous Transfer Methods on my blogs, and links to others, I have to admit the information is difficult to find since it is spread out in a very unorganized manner! So I thought it was high time I consolidate it all in one place so that you can easily find the method that you want to use for your particular project. Below you will find links to 12 different ways to Transfer onto pretty much any type of material, some are my own Tutorials, some are from friends or readers and a couple of them I found online. 1) How to Transfer Typography onto Furniture : This is a two part Tutorial showing how to blow up your image really big, using a free program, and an easy cheap transfer method, so that you can paint your image on large or small pieces of Furniture, Walls or Signs. Great for painted wood pieces or natural wood. 2) The Citra Solv Method : This method uses a cleaning product called Citra Solv. This one works well with Fabric projects, like Towels, Pillows, Chair Seats and Lampshades. This method will give you a slightly faded, slightly imperfect, transfer for an old world look. 3) The Wax Paper Method: I have yet to try this method, but it looks amazing! The only supplies you need are your Printer and some Wax Paper and the super simple Tutorial from Angela at Unexpected Elegance! I’ve seen this one used on Painted and Natural Wood and Painted Metal. 4) The Freezer Paper Method: This one is similar to the one above, only you use Freezer Paper instead of Wax Paper. Lesa at Home Frosting has a fabulous Tutorial that shows you how to use this method on Fabric. 5) The Iron On Method: In this Tutorial I show you how to do an Iron on Transfer, using my favorite Transfer Paper. I consider this brand to be the “Holy Grail” of Transfer Papers, as it completely blows away the other stuff out there. If you’ve tried doing Iron Ons in the past, with crappy results, you will love this stuff! Great for any Fabric Projects. 6) Printing on Fabric: Gail at My Repurposed Life, shows you how to cut out the middle man, and print directly onto fabric, with your home printer! For those of you that sew (or don’t mind gluing your projects) this is a really fun method! 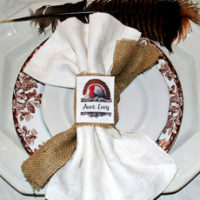 7) The Mod Podge Method: Good old Mod Podge, is there anything this stuff can’t do?!! This excellent Tutorial by Katie at Matsuke explains how to use this technique to Transfer onto Wood. I’ve also seen this used on Fabric, Canvas, Terra Cotta and even shiny Ceramic pieces. This is a really popular method and super versatile since you can use it on so many materials! 8) The Projector Method: Marian from Miss Mustard Seed shares her Sign Making secrets, using an Overhead Projector to transfer images onto wood! This method can be used for Painted or Natural Wood. 9) Using Water Slide Decals: Learn how to use Water Slide Decals to transfer images onto Glass, Soap, Candles and Paper, with this fun technique. Carol from The Polka Dot Closet will walk you through all the steps! 10) The Blender Pen Method: Rosemary from Villa Barnes demonstrates this fast and easy Method using an inexpensive Blender Pen to transfer onto Fabric. I’ve also seen this used on Wood. 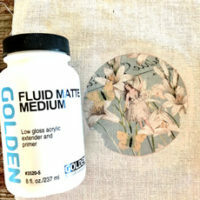 11) The Omni Gel Method: In this Tutorial I explain how to use a liquid substance called Omni Gel, to transfer images onto Tumbled Marble Tiles for Coasters. I’ve also used this on Painted Wood. 12) Gesso on Canvas Technique: Check out how Trisha at Whimsy Art Studios used Gesso on Canvas to create a fabulous French art piece for her Wall! 12 More Easy Image Transfer Techniques: Want even more Transfer Techniques? 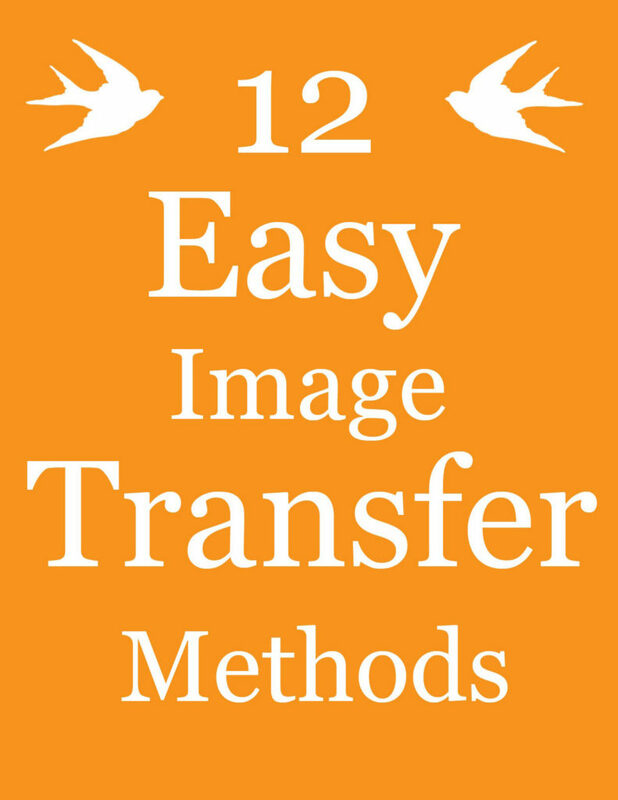 Check out our latest post, for 12 MORE Easy Image Transfer Tutorials, for all new methods and products! Top Tip for Transfers: This is a great post to read before you get started! This tip will save you some headaches and frustration! Favorite Transfer Products: These are my favorite all time Transfer Products rounded up into one place. Well hopefully that will clear things up. Feel free to grab my Transfer Printables to use in your projects. Have fun transferring! 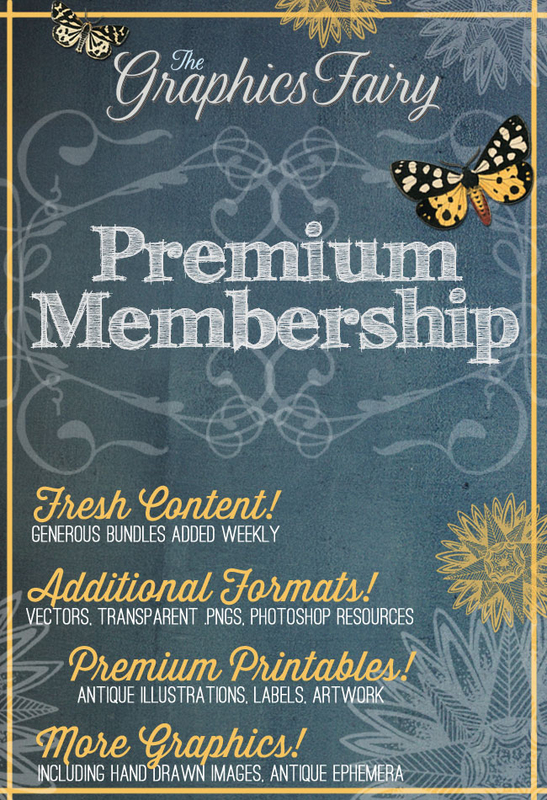 Be sure and check out our Premium Membership site HERE, for loads of PNG images, with transparent backgrounds, these types of images are perfect for Transfer Projects! 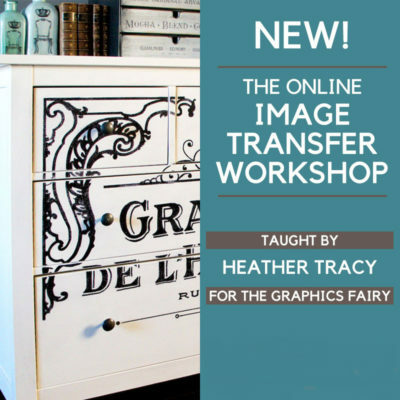 And if you really want to dive in and do professional looking transfers, check out our amazing Online Image Transfer Workshop with Heather Tracy HERE! « Vintage Fairy Mushrooms Image! This is fantastic all in one place, instead of the dozens of pins I have in my boards on pinterest Since you did say share I am going to pin this on pinterest. I’m glad you both liked this! Rebecca, Yes, feel free to Pin! Thank you so much!! Oooh, I’m so excited! Thanks! fantastic post Karen! To have this all in one place is great! I pinned it. 🙂 and I put it on fb, that’s how excited I am about this post! I have tried citrasolv and failed miserably–a friend is going to mail me a copy that she KNOWS is doable. I think my guy at staples didn’t know what he was doing. Thanks for including my post with these other great tips! Prudent Homemaker, How fun, I will have to check it out!! Gail, Yes, finding the right kind of copy is the only difficult part with that method. The Staples copies won’t work, in fact you don’t want to go to any of the large chains, so forget Kinkos, Office Max etc. You need to find an older machine, so try your local Library, Post Office, or an Independently owned Printer place. I get mine made at my local Grocery store. Great post and thanks Miss Karen! Oh, Karen, someone else did it using a wood burning tool that heats up the paper and transfers the ink. If I can find that post someplace, can I post it here too? Thank you! Thank you! Thank you! This is wonderful to have all the methods on one list. I’m going to pin it! This is incredible — I’m sharing this all over the place. Thank you for putting this together! Thank you so much…I have been wanting to try several of these but haven’t gotten my nerve up. This will make it easier to study & decide which one might work best for me. I LOVE your blog & all of the great things you post!!! You are wonderful! Thank you so much! Not only do you provide the world with the most beautiful images, but now you also generously give your time to help others in finding tutorials for transferring your gorgeous images! You have my great appreciation and my thanks! Your information is just fabulous. Thank you, Thank you, Thank you. Thanks for mentioning my transfer method, Karen. I’ll have to check out some of the others. I have spent many hours perusing the net looking for this information. But I just ended up frustrated, and there sits my projects!! Wow, thanks so much for all the nice comments everyone! I’m so glad that you guys are finding this useful! Rosemary, You are so welcome. Your project is so lovely!! Suzanne, Yes, please post it here in the comments! I have one of those tools, but haven’t had much success with it. I could use a Tut for that! Regina, Thanks for sharing this! I really appreciate it! Love it! Now I can get rid of all my bookmarks and just use your post- thank you! Thanks so much Karen – you’re a doll!! Just ordered my CitraSolv (not easy to find over here in the UK and very expensive when you do!!!) but looking forward to trying out all these great methods. Thanks also for the wonderful graphics you share. What is the best way to transfer an image to a mirror? Thanks! Anonymous, For mirror you would want to use the same method as for glass. So try #9. Really nice collection of articles. I haven’t done any art transfers yet, but the two examples you gave are fabulous. Now we need to find somewhere to work the concept into our house! First time I’ve visited your site. Awesome! Thank You, Thank You, Thank You !!!!!!!! Amazing and so informative – As Always!!! You started my creative career and I just love your site. FOUND THE LINK I was thinking of, Karen!!! I haven’t tried it, but I’m sooo happy to have it in my files TO try one day! I often print onto inkjet printable book cloth http://www.julieblanner.com/2011/02/framed-prints.html?m=1 Thanks for the ideas! I can’t wait to try them all! Thank you Julie, I’ve never heard of Book Cloth, I will have to check it out! Thank You so much Karen!!! Very useful! I couldn’t find the “gesso method” tutorial at the link you gave…is it me or the link is not the correct one? Emanuela, It seems to be working fine for me. Here’s the url so that you can cut and paste it http://whimsyartstudio.blogspot.com/2010/10/canvas-of-beauty.html I hope that helps! Thanks Karen – having these instructions all in one place is wonderful! This is fabulous to find all methods in one place. I’m book marking this page right now! Thanks so much for this post! It is nice to have all of the transfer methods in one place. I just posted my how-to-guide on transferring photos to canvas if you want to come and take a look. It is the best method I have found so far for getting crisp, clear images and it also works really well on other mediums including furniture. Hi Mandi, According to the instructions, you need to make sure everything transfers completely or it won’t wash well. The instructions say that “there should be no polymer residue left on the sheet”. So next time maybe try ironing just a little longer first. Thanks for sharing with us the wonderful methods!! I posted a video on how to use the woodworker’s transfer tool on my blog. The tool works on wood, leather and fabric. I have just dicovered your blog (I’m following now in Google Reader)! IT’s amazing!! Thanks for all the useful information and graphics!!! There is a video there of this method. Thanks for sharing all the ways to do transfers! Super great list!! I am trying to find the best method to put a title onto the mat board around a photo. I have hand printed, stenciled, and dry rubbed none of which are what I was looking for. I want it to look like I had the title printed on the board. You can use a warm iron to “fuse” the waxy side of freezer paper to fabric, cut to size and zip the whole thing through the printer. Let the ink dry, and peel off the freezer paper. Presto! You’ve got a crisp image on fabric. The freezer paper pulls right off without distorting the fabric. (I usually iron the image to set the ink) This freezer paper works great for “fussy cutting” a fabric image for quilting or applique, too. Thank you SO much for investing the time and effort it took to bring this to us…you’re wonderful!!! I am coming over [email protected] Delightsome Home. Thank you for those tutorials. Ther are so many inspirations for me. I’m going to forward this to my email list. Thank you so much for this post!! Fabulous and I can’t wait to check out all the links. And…I can’t wait to start using some of them! Your blog is amazing and so are you! And generous! Thanks for providing us with loads of fun! I’m sorry but I have to agree with Anonymous. I have tried several of your transfer techniques and am not having any success at all. I love all your graphics but can’t find a good method to transfer them to wood. Some of the methods may take a little practice. The best thing to do is to try them out on some scrap pieces of wood, until you get the hang of it. If you check out my Brag Monday posts, you can see lots of projects done by my readers, successfully using these techniques. I hope that helps! Does anyone have a suggestion as to what good color printer to purchase? I am looking for a good price for both the printer AND ink! We have 2 printers in the house and neither one prints color copies true. Flesh colors always seem to be a green tinge, and never as bright as I want them, despite fooling w/the settings. yoU are awSome!!! thank yoU so much for posting all these. i can’t wait to get started. #12, part 1 link is not working. Votre blog est magnifique . Merci de partager votre savoir faire et vos belles images. Thank you for putting this all together Karen, what a great resource! I’ve got this linked to my image transferring tutorials roundup post too today! So many projects I’ve wanted to create but had no idea where to start! Thank you for all of the info! Hi, Karen! This is a really good post! You have covered so many good techniques! So, in addition to supplying the world with such wonderful graphics, you are a genius when it comes to their applications! LOL I so admire what you do! I know this post is last year, but, I wanted to share another technique, one for digital stamps/transfers. Over at Captivated Visions, Rachel has done a tutorial showing how to use most any image, and turn it into a digital transfer. Her intent in the post is to show how to use one’s digi-stash in other ways, like art-journaling. Actually, Rachel’s post is part of a series called “Artful DigiScrapping”. The results are just amazing! I see posts all over the place where folks have used your images in new and creative ways, so, I thought of you and Rachel’s post when I saw this one. She has been featured in several places with this tutorial/technique. (No, I am not on her payroll. LOL) She’s a doll, though! Thank you for all that you do and how sweet you are doing it! Help!! Love LOVE LOVE your graphics. 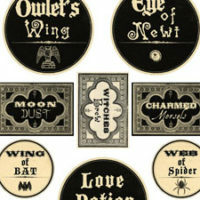 I have picked one to transfer to wood using Mod Podge (for Images). Here’s my question…how do I make the background transparent. I did a test on a sample wood and I see my white background behind the print graphic. You’ll need to cut around the design very closely to get rid of the white with that method. Or you can paint your wood white to match. I hope that helps! Hi Karen, Love your blog. Do you have an ideas for transferring images to plastic? I am trying to transfer an image to the plastic part of a pacifier. Thanks Kim. by the way I have a ink jet printer. Thanks again. I’m not sure about plastic. I would definitely recommend not transferring onto anything that would go into a babies mouth, it’s just not worth the risk. Perhaps you could make a cute bib or onesie, using an iron on instead! Thanks for letting me know! I just fixed it!! With the risk of sounding stupid, I have a question. I printed out the mirror image with the taps paper but when I ironed it down, it reads backwards. What am I doing wrong? Thanks, You are the best!!!! Hi, Karen. I can’t speak English ver well, but i’m hope You Understand me. I’m writing from Poland. I love Your blog and everything You do. You inspiring me:) Thanks. I find Your Transfer Methods. May be You will be interesting my method of transfer (haw does CarPlan work). Thank you so much. I would love to learn to do this and I need all the help I can get. I really appreciate it. Once I click on the image I want, how do I mirror image it (my printer won’t do this) and shrink the size to fit what I am working on. wow!!!!! The “How to Transfer Typography onto Furniture” has really helped me a lot making a birthday present for my grandad. thank god you were here to help. you have saved my day ! only a few days ago I found your site by chance. Such a lot of amazing things you have collected! It makes me want to start at once with lots and lots of projects! I´d like to add another form of transferring prints on fabric. Did you ever hear of lavender oil as transfer medium? You print your pattern with a laser printer, fix the paper face down on fabric with tape and soak it with lavender oil (you find it in drugstores for aromatherapy or things like that) then you rub the print with the back of a spoon or any other round, hard tool. It takes some pressure and about 15-20 min to get the colour on to the fabric. You can look once and again, whether it is sufficiently transferred. After removing the paper let it dry a day, then you can fix the colour by ironing as hot as the fabric allowes. So you can even wash it. Thank you so much Karoline! I’ve never heard of that method before! I think it would be lovely to work with too, since the fragrance would be so nice! Hi Karoline – I love using essential oils for laser print transfers! I carry an item with me every day that I decorated this way and it still has a lovely fragrance, even after over a year…I’ve used lavender essential oil and patchouli oil both with success. I used to use the Blending Pen method, but I’ve converted – less toxic, less expensive, more fun. Thanks for mentioning using it on fabric – I haven’t tried that yet, but will have to, now! I’m wondering how you use Lavender Oil to transfer an image? Would you be able to write back and tell me briefly step by step? I just found your website and it’s amazing. I just have one question, do you need a laser printer or a regular inkjet printer for transfering?. I’ve tried the ModPodge method and for that you need a laser printer. And last night ,i tried your method on freezer paper and the ink looks quite fresh ,almost runny and didn’t transfer as well as yours. Hi Maggi, It just depends on the transfer method. Each method should have full instructions and should tell you which kind of printer to use. I hope that helps! Maggi, I tried the Mod Podge method yesterday and used a laser printer – it worked just fine – I’m ectatic about it!!! Hi Karen,I know this isn’t technically on the subject, but I downloaded some bird graphics. Block Poster is fantastic. I found some fonts, downloaded to write Faith, Hope, Love, but I can’t figure out how to use them. Do I need to download something else before I can write with the fonts? Hi Karen, I tried to use Block Poster last night and it’s a great tool but it only accepts jpg files and your files print in pdf format. Has anyone else had this problem? Hi Terry, Instead of saving the PDF file, just click on the picture of the transfer in the post. You can save that picture and use it instead, as it’s in JPG format. I hope that helps! Karen,Came across your web site yesterday.Amazing I Iike the idea how you personally connect with each person.Rarely do see that.Some of us are just learning Your willingness to help is so appreciated.I’m sure i speak for all who are just learning.’THANK YOU’. I’m sure i will be a regular. Thank you Trudy. I wish I could connect with every person, but unfortunately it’s really tough to find the time anymore! I hope you will enjoy yourself here and visit often though! How can I transfer a large graphic onto fabric (say 24’x15′ onto a cotton)? Would I need to have a printer (kinko) print it out for me and then citasolv it with a paintbrush, or can i have a printer’s print it right onto the fabric? I realize this is not quite DIY – but would be if I could laser large prints!! Hi Sidney, click on Method number 1, we have all that info right on the post. Have fun transferring! I decoupaged a color print onto a Americana Decor Chalk painted desk top. The color image transferred really nice but the white of the paper background adhered to much to the desk and is also leaving a halo affect around the color image. Does the chalk paint have to be sealed first? Is there any way to remove the white background completely. It just won’t rub off no matter how wet I get it? I have an easy way to transfer things to any hard surface. A friend of mine showed me this years ago and I was able to paint Disney babies on the side of my son’s crib. These days I use it to make customized gift bags. Find an image you like and print it, doesn’t matter what kind of printer. or if you’re like me and too cheap to buy ink (seriously I can just buy another printer cheaper than the ink for mine!) hold a piece of paper up to the computer screen and trace it (if it’s simple enough!) After you have your image, turn the paper over to the wrong side and mark where the top, bottom and sides are of your image. Keeping the paper on the wrong side, color in with a pencil (I just use a standard no. 2 pencil) and color in where your tick marks are. You have to color the entire back of the image with pencil, using a little pressure. Then turn the image around and retrace over the image onto your surface. Take the paper away and now you have your image on whatever it is (in my case, those paper brown gift bags!). You can then paint the image. After the paint dries, go over the outline again with a fine tip sharpie, and fill in details like eyes, mouth, etc. I would love to Pin these directions. Can you tell me how? Sure! Just hover your mouse over the picture, until you see the word “Pin” pop up. Click on it, and save it to one of your boards. Easy peazy! Hmm. Still missing method of Annie Sloan chalk paint transfer to chalk painted surface using decoupage, I know it can be done but don’t have copy of her book. Decided after I painted (before wax) to do transfer but no one seems to have relevant details. Do I remove some of the existing ascp? Does it have to be smooth? Do I put the AS decoupage OVER the printed image, or just on the furniture side?. Only utube I found was saying to use inkjet copy &.I know THAT is wrong. I don’t want to wreck it. Sigh. Siobhan, Before doing a big project, I always recommend testing out your transfer method on a scrap piece of wood first. Practice makes perfect and since we are all using various different types of paint, and different printers/copies and different waxes, it’s really the best way. Grab a couple of scrap pieces of wood and do some practice boards and take notes on what you did and which products you used, then you will have your own perfect recipe and the confidence to work on your larger pieces! Very excited about image transfers on to fabric. Can you recommend a product that will work with a laser printer? Hi Jo Anne, I don’t own a laser printer, so I’ve never tried it. I know that there are products that are made just for laser printers. Lasertran is the name of one I believe. Wow I can’t wait to get started after seeing you designs. Thanks for putting it all together. This is awesome! Love that you gathered all in one place! Thank you!? Hi Pat, I’m afraid I don’t know, but this post should help you to figure it all out https://thegraphicsfairy.com/top-tip-for-working-with-transfers/ We use Annie Sloan paint here in the states quite often, since she is based in the UK, you might want to give that a try. I hope you will give transfers a try as well! Woo Hoo! I’ve been trying to transfer my rather complex original design onto a dark blue fabric for embroidery. I didn’t want to trace it because I wanted to get the line thicknesses accurate. I tried sew and tear but the fabric was too stretchy. I then tried the print and iron method but both the original and the copy on the fabric was much too faint. Finally I read through your post and all of the comments and I tried the wax paper/freezer paper idea (although I used transparency film – because I have lots of it-that was agreat suggestion) and it worked! I am so happy. Thanks to you and your commenters I can finally finish this project that has languished for months. Yea!!! That is wonderful Jools, so happy for you! Always see lots of great ideas! Love it! I have found that using the overhead projector transparency sheets (not the inkjet ones) work really well. The ink stays wet and allows a great transfer without having to cut paper to size! Thanks Sarah, great to know!! in the Vintage Robin, Bird Nest Frame and Bird-Frame-Vintage. Any help you can suggest would be most appreciated. Thank you. Hi. Could you please guide me a bit? I have a few pieces of wooden ply-board and want to transfer using mod podge. Can it be transferred onto ply-board. If yes, then do i need to smoothen the board with sandpaper or a slightly rough texture will do?? My boyfriend’s birthday is in a week’s tome and i really wanna make a photo transfer in wood for him.. Please help. You should be fine with the wooden texture provided it isn’t splintery which might make it harder for the Mod Podge to adhere. I always recommend that it’s a good idea to try any project out on a scrap piece of wood first just to get the technique down, practice makes perfect 🙂 Good luck with your project! Do you know how I can make colorable images with raised lines so kids can stay inside the lines EASIER? Thanks! Instead of using a credit card is it possible to use a warm, steam iron for rubbing off the transfer? Would like to get free images, thank you! Maybe subscribe later but I just am looking for images for my own pieces of furnisure. Thank you. Wonderful! That is exactly what we offer at The Graphics Fairy! All of the images on the blog at thegraphicsfairy.com are free of charge for you to create whatever you wish 🙂 Enjoy! Wow best list ever on transfer methods I will refer back here when I’m doing crafts. This list is great I will make sure to refer others here. Thanks so much Brittany! I’m so happy you like the transfer methods and hope they help you create great things! Would someone be able to tell me how I can transfer/save my children’s drawings on the bottom of my dining room table? I want to save the “artwork” but not the table. I got a mirror for a present with a family foto on. Can’t see how it’s made. Will you maybe be able to help me? Hi there! I LOVE your site and I’ve found it to be very helpful. However, if it’s possible, I’d like to see some kind of printable for “Home and Family.” Is this something that you might be able to add to the site? Thanks a bunch and have a blessed day! Just wondering, can you transfer an image from a poster? I was wondering if I bought a poster and wanted to transfer the image to several tiles, would it work or do I absolutely need to print out the image to be transferred? I wanted to make transparent film art on a flat glass. Could you please let me know how to it. I hope you don’t find this to odd a question. I am trying to find a method that would allow me to transfer color prints to thermoplastics (e.g KYDEX) materials. is this anything you could help shed some light on. thanks in advance for any help or advice you can give. I’m looking for a transfer method to apply lettering to brass or aluminum plates for an acid etch process. I had a company silkscreen apply some patterns on and that worked great but that company is now gone. I’ve heard there is an iron on method…What can you recommend ?? Hi Roland, I’m so sorry but I’m not familiar with that process or what product you would need for that.